In peacetime or wartime, an airfield can only operate efficiently if all of its personnel are working together. And RAF Langham was no different. Everyone’s work was valued, from the ‘lowest’ ‘Erk’ to the Station Commander. 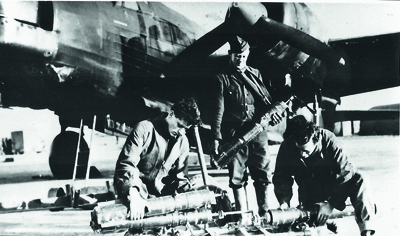 ‘Erks’ were members of the Ground Crew – the men and women who serviced and repaired the aircraft. 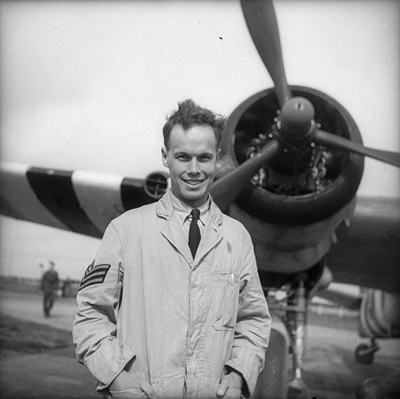 ‘Erk’ may not have been a particularly flattering nick – name but their roles, especially in wartime, could mean the difference between life and death for the aircrews. 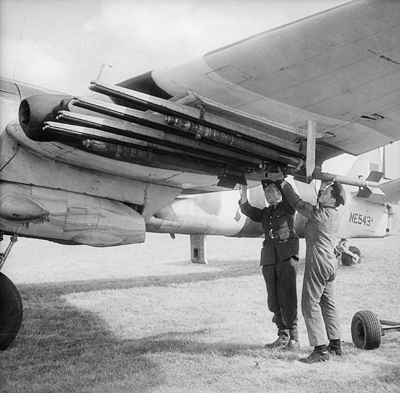 As well as keeping planes airworthy, in times of combat ‘Erks’ also made sure that an aircraft was loaded up with bombs and torpedoes and that its guns were armed. So without them not a single plane could have taken off, nor a single enemy ship have been sunk. It wasn’t just men who did many vital jobs on an airfield either. 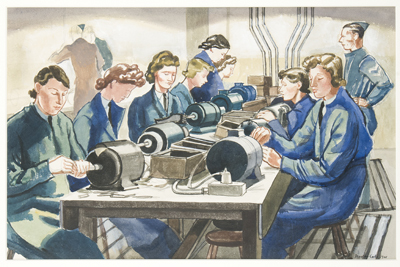 Just as their help had been called upon in WW1, women trained in all sorts of new skills to fill vacant jobs in WW2. As well as doing vital clerical and catering jobs, women were also repairing, arming and flying (in a non-combat role) aircraft, driving and maintaining lorries, operating wireless and radar and helping ‘man’ anti-aircraft positions. Many lost their lives whilst performing these vital tasks. Without the Women’s Auxiliary Air Force (WAAF), the RAF undoubtedly could not have operated so successfully during WW2. There were two dedicated women’s accommodation sites at Langham and members of the WAAF came from a variety of backgrounds, rich or poor, from across the UK and abroad. In emergencies, people can be extraordinarily brave. On the night of March 25th 1945, a heavily-loaded bomber crashed and burst into flames soon after take-off. Leading Aircraftwoman, Ivy Cross, WAAF, drove her van over several fields and reached the crash site quickly. She helped drag clear a number of crewmen while explosives were detonating all around. A few hours later she did it all again for another crashed aircraft. Ivy was awarded the British Empire Medal in recognition of her bravery during these two and an additional ten separate occasions in which she risked her life to save aircrew from crashed and burning aircraft at Langham. Knowing about present and future weather conditions is vital when planning flights. Meteorological Assistants took observations every hour on temperature, air pressure, wind direction & speed, cloud types (height and quantity) and visibility, before sending to Meteorology Head Quarters (MHQ). They also produced a weather chart every three hours and informed the aircrews what kind of weather to expect on their missions. 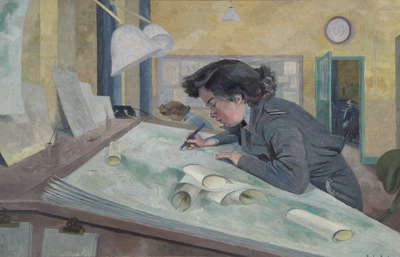 Women’s Auxiliary Air Force (WAAF) officers undertook many such roles, analysing and mapping weather data to make accurate weather forecasts. Throughout the airfield’s active life there were people working here continuously to measure and predict weather conditions. This was crucial for safe take-offs and landings and to avoid weather-related disasters on bombing and strike operations. RAF meteorological squadrons flew accurate routes at specific heights to take measurements such as air temperature, pressure and humidity to help predict the weather for operational missions. This information made it possible to decide whether to go ahead with a particular operation or to cancel it. Pilots flew Hurricanes on THUM (Temperature and HUMidity) flights. This information determined whether or not to go ahead with a particular mission/operation. Accuracy was vital and pilots had to fly many different kinds of aircraft – whatever could be spared from operational units. Close to the base, these aircraft could be Gladiators and Hurricanes or over Europe and the North Sea the, Hudsons, Hampdens and Venturas. For the furthest flights, to Norway and over the Atlantic, old Coastal Command Fortresses were used. Runway Controllers had to be extremely observant and to be able to cope with numerous aircraft taking-off at once. And they had to be able to take action quickly when necessary – for example, firing flares at a contractor’s lorry to get it off the runway when an aircraft needs to land! They required a basic understanding of the weather as it affects the day’s flying so as well as making some observations of their own, Controllers received detailed weather reports from the Meteorological Office at Mildenhall every day. Daily runway inspections were another responsibility, as well as updating the signal square which tells airborne pilots that ‘temporary obstructions exist’ for example. Working together with a pilot, Target Drogue Operators towed targets for the trainee gunners at Weybourne and aircraft training camps. They were responsible for packing the long cloth targets and putting them into their covers, as well as making sure they were properly attached to the aircraft. Approaching the firing ranges, the operator had to kneel on his seat to launch the target and let the winch pay out 2500ft (770m) of cable. It was easy to make a mistake with the winch buttons; the mechanism could drop the target at the wrong moment. Crossing the firing ranges at a height of 800ft (244m) – first from west, then the east – towing aircraft would finally approach the guns head-on in a shallow dive. Black smudges of exploding shells would surround the target as the gunners fired. The cloth usually disintegrated after being hit many times. Whether damaged or not, the target was then dropped onto the range to be examined for hits and then returned to the airfield by the army, if it was worth using again. These voluntary jobs meant people giving up a couple of evenings a week to work in the services’ social club set up in Langham village, first in the Parish Rooms and then in a specially renovated barn. Volunteers meet and get to know all sorts of people as they served tea, coffee and cold drinks for the servicemen and women. Sometimes these volunteers helped out with the mobile canteen trailer. Everyday, the trailer takes morning and afternoon tea to the ground crews working on aircraft out at their dispersal stands. On occasions, women in these roles also found themselves acting as mother, sister and counsellor to service personnel in times of grief during the war. Not a glamorous job maybe but an absolutely vital role nonetheless. Drivers supported the aircrews at Langham by making sure that things go ‘without a hitch’ for them on the ground. Driving mostly a heavy Bedford lorry to pick up the aircrews, they took them from their living accommodation to their Mess room for a meal, then to their briefing session and finally to their aircraft. Sometimes, the first pick up could be at 2am! A driver’s main responsibility had to be checking that his vehicle is roadworthy and drivable. As well as transporting crews in the Bedford, drivers operated a variety of other vehicles: sometimes an ambulance, sometimes a tractor and bomb trailer (plus bombs), sometimes a van or car. They could even be driving a fuel tanker. Drivers had to keep their wits about them as they navigated the aifield. Aircraft – especially travelling at speed – always have priority! Drivers also had to brace themselves for the fact that sometimes they might take crews to their planes and never see them again. The importance of this job is impossible to overstate. An Aircraft Recognition Instructor may work with classes of anti-aircraft gunners or aircrew, teaching them to tell the dfference between enemy aircraft and friendly ones, often in bad light and at high speed. Their skill will make the difference between life and death so teaching them well is essential! Gunners had to be taught not just how to recognise a hostile plane, but how to identify its type in order to know its speed. They needed to know this so that they could work out how to shoot it down. Instructors were supplied with photographs, films, sound tapes, flash cards and models of allied and enemy aircraft to test a trainees’ skills and knowledge. In charge of the training sessions in a Dome Teacher, the Instructor had 12 or so different films of planes attacking from dfferent angles, at different heights and varying speeds. Almost every type of enemy aircraft was featured, from slow, heavy bombers to very fast fighters. Instructors chose which film to use with each group of trainees, working out what they were going to look out for during a particular ‘attack’. The training always revealed one or two gunners who stood out from the others. Insturctors would often have some small prize to award to the gunner who gets the highest score in each group. Maybe a couple of bottles of Brown Ale? RCAT Operators were based at Stiffkey in the early Cold War years of the 1950s. Their role was to give anti-aircraft gunners practice in shooting down enemy aircraft. The Operators had to assemble the RCATs, as well as prepare them for flying. A realistic and powerful model aircraft with a 12ft (3.6m) wingspan, they were loaded onto trailers and towed to the launch track at Stiffkey or sometimes Weybourne. Flying the RCATS by radio/remote control over Stiffkey Marsh, the remains of the Operator’s assembled machines would litter the Marsh when the gunners were accurate. 524 Squadron groundcrew at langham. © www.flypast.com. 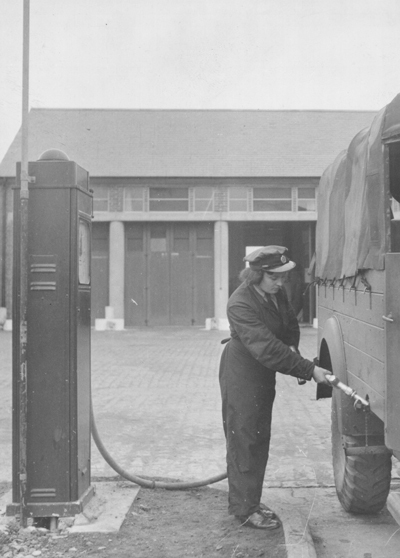 WAAF driver filling up lorry with fuel, circa 1941. © Trustees of the RAF Museum. Section Officer Austen: WAAF meteorologist. © Trustees of the RAF Museum. WAAFs cleaning sparking plugs. © Trustees of the RAF Museum. 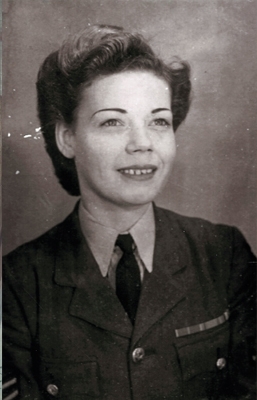 Ivy Cross, photographed after being promoted to Corporal. © Bridget Newman.